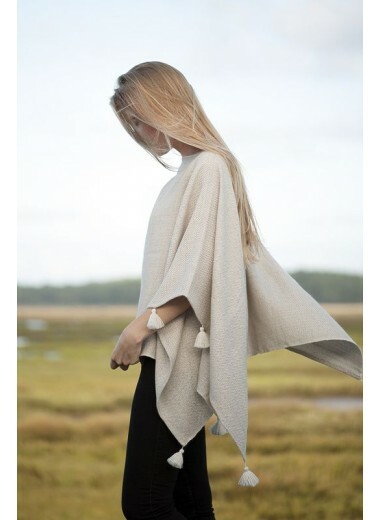 Contemporary, versatile and feminine, the poncho has become an essential piece ! 100% Baby Alpaca The encounter of a sweater and a poncho has given birth to this magnificient piece. Loose and flowing, splitted sides, sleeves with a ribbed stitch, great mix of colors : Stand out ! Raquel is a stylish and elegant piece for winter. NEW ! 100% Baby Alpaca Outstanding and so chic ! The Stella poncho is a beautiful and unique piece woven on a traditional loom. Its pattern made of small heringbones and its flowing style makes it so elegant. Its shape is rectangular and at each end and each side a little handmade pompon finishes the style. 8 in total. Stella, a new handwoven poncho ideal for spring and summer.